Partridge Feather This perennial is ‘Mountain Grown’ at Alpha Nursery and is an ‘Idaho Preferred’ Plant. This perennial is a ‘Plant Select’ plant. Partridge Feather is a mounding perennial with gray-sliver leaves. It is topped with bright yellow flowers in early summer. It will grow to a height of 10 to 12". 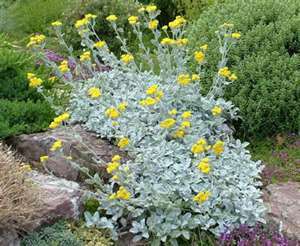 It likes to be planted in full sun and well drained soil. Use Partridge Feather as a specimen in a rock garden, mass planting in a perennial bed, or as a border plant. Partridge Feather will attract butterflies and is resistant to deer. It makes a great cut flower and becomes drought tolerant once it is established. Partridge Feather is also a 'Plant Select' plant.